These Pro/Street Small Block Chevy harmonic dampers by Pro Race Performance Products have been machined to tolerances far exceeding those used by OEM’s. Dampers weigh 11.4 pounds. These Dampers feature an amazing overall surface finish. Permanent rolled-in timing marks are very visible and will never fade or become less visible! Nodular Iron, also referred to as ductile iron, is typically the material used for heavy duty or racing applications of cast iron products. It is approximately 30% stronger than gray iron. So it was only natural that when PRO/RACE developed the heavy duty OE replacement PRO/STREET dampers, high strength nodular iron was the material of choice. rpms than most competitive models. (Note: The PRO/STREET Nodular Iron Harmonic Dampers are NOT SFI certified). However to prove the integrity of the PRO/STREET dampers, we had the SFI test lab run some spin tests. The PRO/STREET damper was subjected to 8,000rpm for one hour, and then 12,500 rpm for 15 minutes with no sign of degradation! (note: this by no means suggests the PRO/STREET damper should be used in extreme applications – use PRO/RACE or PRO/SPORT for high performance applications). Harmonic dampers are supplied in two styles; those for internally balanced engines and those for externally balanced engines. Externally balanced engines have a counterweight bolted into the hub of the damper. 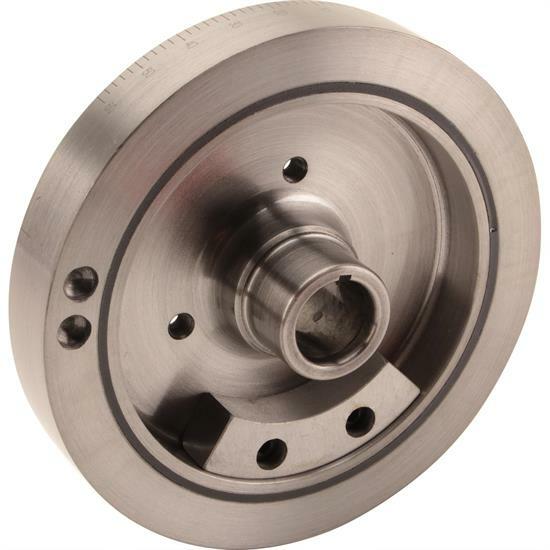 The advantage of having a removable counterweight in the hub eliminates the possibility of having the counterweight mass move from its position plus it provides an extremely accurate external balance mass. The PRO/STREET Damper for internally and externally balanced small block and big block Chevys and for small block Chryslers is identical except for the counterweight. This means, for example, if you have a PRO/STREET Damper for a 400 small block Chevy you can remove the counterweight and the damper will work perfectly for a 350 Chevy. Conversely, if you have a 350 Damper and want to use it on a 400 you can now purchase the proper PRO/RACE counterweight and bolt it into your 350 damper and it is now a 400 damper. • “Nodular Iron Construction – Most cast dampers are manufactured from gray iron castings. Nodular iron is over 30% stronger than gray iron. • Bonded Elastomer – Outer ring and inner hub are bonded (vulcanized) to the elastomer. This minimizes the potential for the outer ring to move on the hub, losing true TDC position. • Removable Counterweights – Externally balanced models feature bolt-in counterweights, making it easy to switch from an externally balanced engine to an internally balanced engine. In this Tech Tip, John discusses LT1 rotating assembly options for a customer looking to build a solid autoX, drag, and occasional strip powerplant for his Firebird.